You might have a problem with us telling you to lay your hands off that Chocolate Cake for a while but don’t you think life is too short and you should experiment while you can? Try out something new in your kitchen the next time you have a yearning for making a dessert. 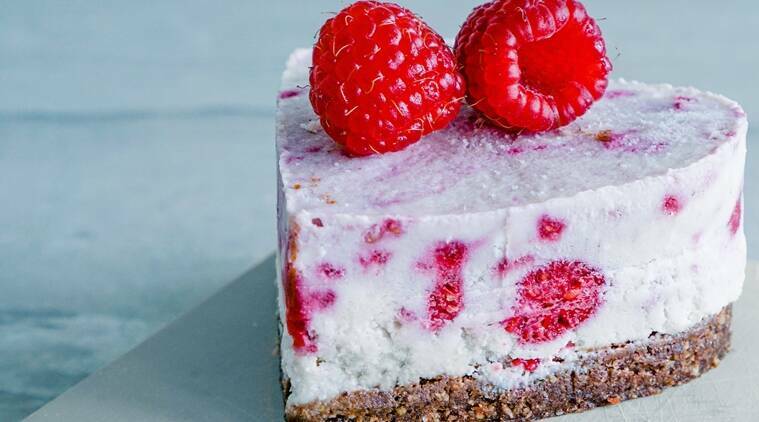 This Raspberry Cheese Cake recipe by Chef Ashish Rai, Head – Culinary, Barbeque Nation will blow your mind away! * Grind the biscuits, and then add butter, brown sugar to it and mix it well. * Take a 8 inch pan and layer it with the biscuit mixture evenly on to the bottom and the sides of the pan. Rest it for 30 mins and then bake for 5 mins, till it turns crusty. * Take half of the raspberries in a pan with ¼ cup sugar and 2 tbsp water and cook till the raspberries are quite soft. * Remove from heat and blend it to form a puree. Put it over slow flame once more. In the meanwhile, add water to the gelatin sheet and let it rest for a few mins. Then add gelatin to the raspberry puree until it has dissolved. Remove it from heat. * In a stand mixer, beat the cream cheese and sugar on medium-low speed with the paddle attachment until smooth. Add the vanilla extract. * Now, add the raspberry topping, except the 3/4 cup you have reserved for the top layer. * In a separate bowl, whip the heavy cream until the medium peaks. Gently fold the whipped cream into the rasberry cheesecake batter just until it’s all combined. * Pour this mixture into the crust pan and set it in the refrigerator for 3-4 hours or until set. * Remove it from the pan and serve it with some fresh raspberries on top. * You can also use a little desiccated coconut for the flavour.